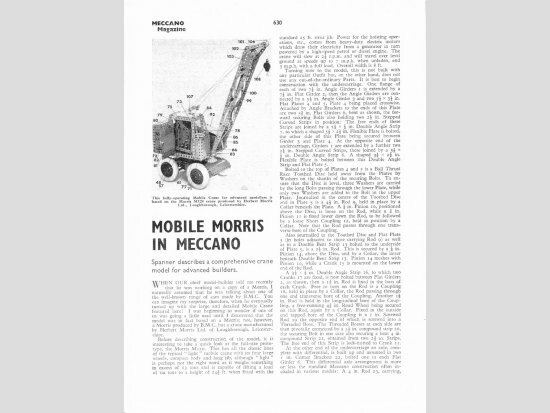 I recently built the ‘Mobile Morris’ Crane featured in the December 1968 issue of the Meccano Magazine. Encountering numerous problems with it, I wondered if anyone else had tried to build it, and if they had run into the same troubles I had. 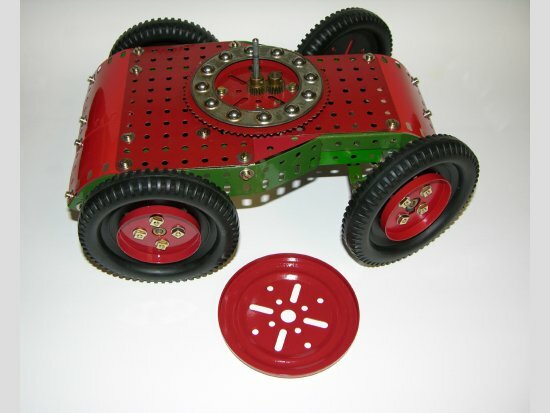 I was first attracted to this model because I think it’s mechanisms that really interest me with Meccano, and I actually wanted to see how their ‘chief model-builder’ (who would that be in 1968?) coped with driving, steering, and slewing this relatively small crane – all through the Thrust Bearing. If I told you, Not very well, would that surprise you? The instructions start out with the usual MM disclaimer – ‘this model…is not built with any particular Outfit but, on the other hand, does not use any out-of-the-ordinary Parts’. Oh, no? At least 12 of the ‘Parts Required’ are not even contained in the 1968 Outfit 10 – which makes them out-of-the-ordinary enough for me! They include the 4¼” Road Wheels (Part 187b, which I don’t have, and I understand are now pretty rare), and the ¾” x ¾” Pinion (Part 25b – I bought one specially for this model –which, in fact, turned out to be unnecessary). To add insult to injury, the ‘Parts Required’ List includes a 3½” Gear Ring (Part 180), a couple of Buffers (Part 120), and 38 (yes, 38) 2½” x 2½” Flat Plates (Part 72) – none of which are actually used in the model! Like other models I have found in the MM, the instructions for the Morris Mobile Crane are sparse and the illustrations foggy. I even tried enlarging and printing out the illustrations on glossy photo paper to see if that would improve things. Not much! I still could not make out which holes the gearbox rods should use. I had to guess and then amend. Even the instructions for the simple Jib were inadequate and inaccurate. They say, ‘Make up two 17½” compound strips from 9½” Strips overlapped two holes’. Well, if you do that it makes 18” Strips! So I overlapped three holes, but then the top part of the Jib does not angle downwards like it should. What is actually needed is one 18” Strip and one 17½” Strip. Why couldn’t they get even that right? While I am pleased with some aspects of the completed Crane (I think it looks well), I was frustrated and disappointed by the non-functioning results of the model as described in the MM. 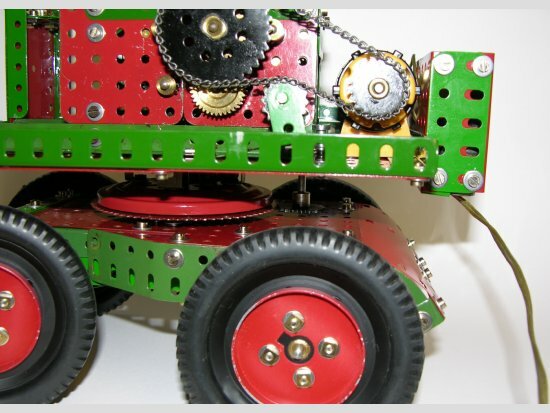 The steering, drive train, and slewing are all pretty dodgy. 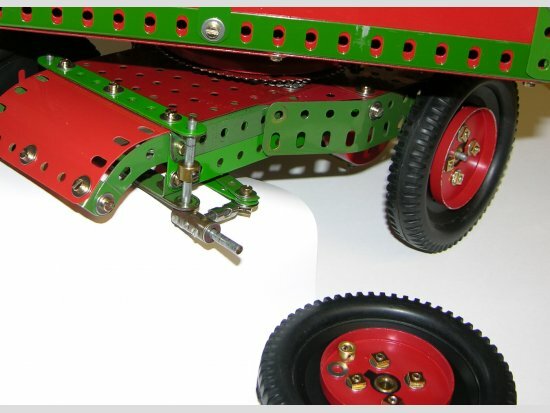 I also ended up having to improve the front axle arrangement (to prevent the wheels from splaying), changing the gearbox and the windings – adding extra small Pulleys and Large Washers to prevent the cords from fouling the gearbox or frame. If I were to build this again(!!) it would probably be better to actually grind down the bosses to ease the fit inside the Thrust Bearing. I also found it necessary to introduce some reduction gearing into the steering linkage to give a more secure action. Once the Crane was completed, I found that the drive to the undercarriage wheels was very sluggish. That too has to go through the Thrust Bearing, and the forward weight of the Jib (more than one pound, 2.2 kilos) puts a lot of stress on the central drive rod, so there is some binding. My solution was to add a counterbalance weight at the back of the cab (why didn’t they? ), and to introduce more reduction gearing to the drive train, to give extra power before it goes through the Thrust Bearing. 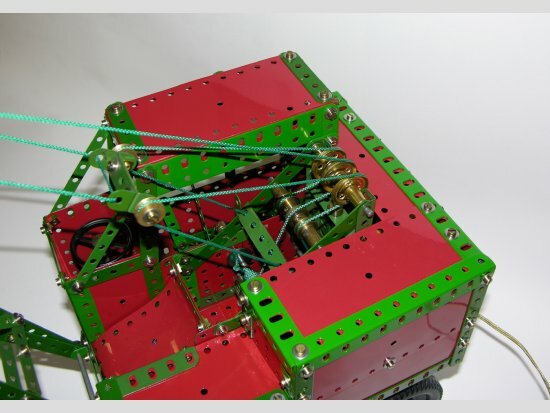 The Crane uses a horizontal chain drive for slewing, and although there is a very short distance between the ¾” Sprocket and the Thrust Bearing teeth, after a while, it kept falling off. And it was an absolute pain to try to re-seat it. In desperation, I tried using a 1” Sprocket as a pinion engaging the Thrust Bearing teeth – and completely to my surprise it worked! I was amazed that the single Sprocket thickness remained engaged with the Bearing teeth, especially considering the weight of the Jib – my counterbalance must have worked. Next time(!!) it would obviously be better if I could find a 1” x ¼” Gear with teeth that match the Sprockets (does Ashok make one?). Failing that I could place two 1” Sprockets face to face, but there wasn’t room for that in the present situation. In finishing the Cab I ignored the MM instructions for the most part, and built what was necessary for my version. I added more of the ‘panelling’ effect, using extra Girders and Strips, and in the end I reluctantly decided to omit the driver’s door altogether, leaving instead extra ‘window’ space to allow easier access to the controls. 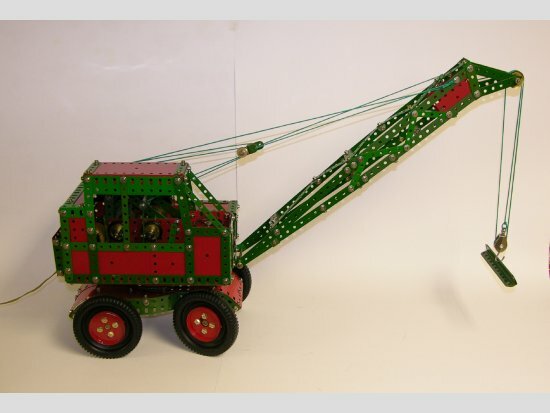 It probably no longer qualifies as a Morris Mobile Crane – but then, I suspect, neither does the MM version! In the MM instructions they talk quite a lot about the prototype, but show no pictures of it. 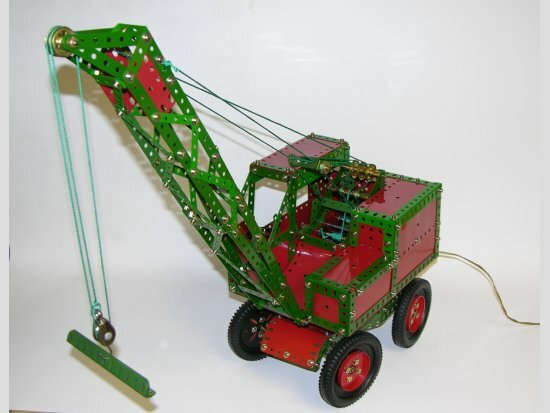 I have tried in vain to locate pictures of the original Morris M120 Crane. Pity, it would have helped a lot to see what they were trying to copy, and to make more informed improvements myself. Has anyone else had better success with this ‘Mobile Morris’? Ashok does indeed market a 1"x1/4" 20t 20dp Gear which meshes quite well with the sprocket teeth of the Thrust Bearing. See part no. 1101. Another solution to the ball race problem is to use a 3.25" gear instead of the toothed disc, and then drop a pinion on to it. This solution is used in the SML19 steam excavator and works well. Models of this era were obviously not "written up" by the actual builder, hence the many errors which appear. The steering mechanism Pinions fit easily inside the Bearing if the Gear Ring is slipped inside as well! Now you know why I'm not a mechanisms person, Stan!